Klackers comprised two acrylic balls, often brightly coloured, on a string with a small handle in the middle. It was a playground craze that swept Britain and America in the early 70s. The idea was to move the handle up and down to make the balls click together. The really skilled could make the Klackers meet at the top and bottom of a circle; it required practice. They made a noise when they clacked together, hence the name. 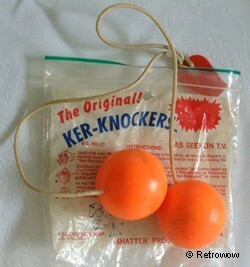 Klackers were also marketed as Ker-knockers, Clackers and Klickies. Whilst children loved the Klackers, or Ker-knock-ers, parents and teachers were concerned about the safety aspects. They could cause bruised hands and arms and the balls could shatter into dangerously sharp shards of plastic. Some schools banned them from the playground. Like most crazes, Klackers disappeared as quickly as they appeared.